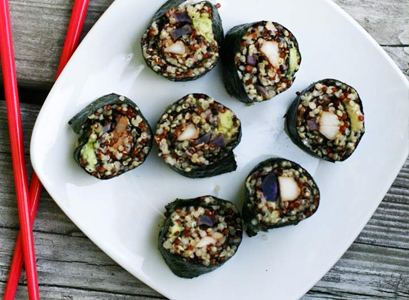 A delicious recipe for Quinoa Sushi Rolls from Cheap Recipe Blog. Prepare quinoa: Prepare Success® Tri-Color 100% Quinoa according to package directions, adding bouillon and soy sauce to the water. Once cooked and cooled, place quinoa in a large mixing bowl. Add rice vinegar and maple syrup and mix. Place quinoa in the fridge until ready to assemble rolls. Prepare chicken: Cut chicken breast into small strips. Place in a bowl and add teriyaki sauce. Allow to marinate for at least 30 minutes. Fry chicken pieces in a bit of olive oil until internal temperature reaches 165F. Set aside, and refrigerate until ready to assemble rolls. Roast yam: Peel yam and cut into French fry-sized pieces. Toss with olive oil, salt, and place on a large baking sheet. Bake in 375F preheated oven for 20 minutes. Remove from pan and set aside to cool, until ready to assemble rolls. Assemble rolls: Using a sushi mat, lay a nori sheet down, shiny side down. Top with quinoa, enough so that the nori sheet is covered, leaving the top inch or so bare. Top with additional ingredients (chicken, avocado slices, and roasted purple yam). See photo above. Start rolling the sushi from bottom to top, making sure you keep the roll tight - you don't want it to fall apart when you slice it. Repeat with remaining rolls. This should be enough to make 6 rolls. Cut rolls: Cut each roll into 8 pieces. Serve with soy sauce, sriracha mayonnaise, and desired other condiments such as pickled ginger and wasabi.